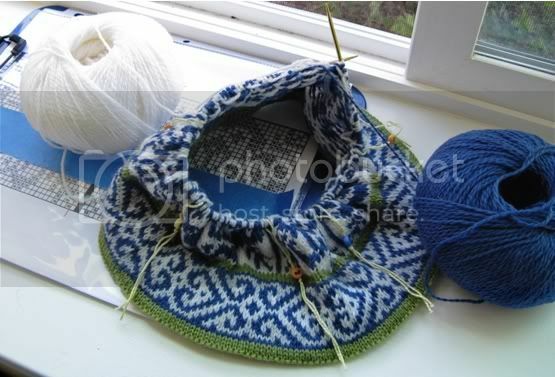 Right now I am working on a hat I put together using Fair Isle patts from a couple different books. That isn't exactly rave green, but it's nice. I think the crown will have white on a green background. I'm repeating two different patts around the hat so I made some stitch markers with #1 and #2 beads (a bead with a heart on it marks the end of the round) so I can tell at a glance which patt I'm working on. 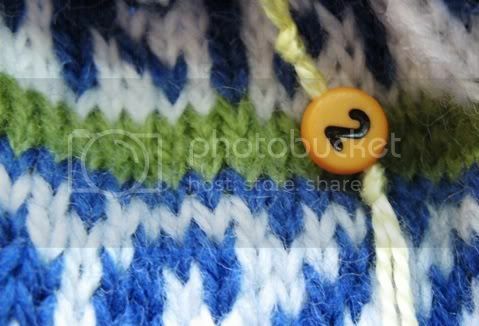 I bought a container of number and letter beads at the dollar store for this specific purpose a couple years ago and finally had a reason to make numbered stitch markers for a project. OK, that was just a joke in case you couldn't tell, I have zero interest in yarn matching this color. It's a little extreme for me, but it looks wicked on the pitch don't you think? I wasn't sure what to make of it when they rolled out these 3rd kits at the beginning of the season but I'm digging them now. I know Sounders fans read this blog because I received great comments when I wrote about translating the team colors to yarn last year. So I'll keep talking and you can leave now if you don't like soccer. The above photo is from the Sounders vs Metapan game in El Salvador a couple weeks ago (for the CONCACAF Champions League, not an MLS game), it wasn't on network TV or basic cable so if you missed it be sure to watch this video of El Flaco's goal. It's world class and Riley deserves credit for putting the ball right where it needed to go. Hit that link and scroll down, you'll see the video ready to click on. Does the Front Office know what it's doing? YES. Brilliant work signing Fernandez. Guys, just one little thing: Fredy Montero needs to be DP #3. You know he's worth it. If we let that kid slip away I will fall apart and you don't want to see me in pieces. We play for club. We play for city. We play for country. We play for our first Champions League trophy. We play for you. If you have a USL/PDL soccer team in your area please check them out. I attended some Kitsap Pumas matches this season and those kids rocked my world. They exceeded my expectations. I had been watching Pumas videos on YouTube but it's not the same thing. You miss a lot of action if you only watch the goals. The Pumas are a top notch team in their league, but they're in the PDL (which is the 3rd tier in USL) so I wasn't sure if they'd keep me entertained. How good could they be, you know? Would this be like watching high school boys kick the ball around? NO. They were fierce, they played with heart and a passion that is missing from some MLS teams (cough). They have skills mama. No joke. Go see if your local team can match my experience with the Kitsap Pumas. The boys in PDL feed off your support. They play for the love of the beautiful game and it shows in their efforts. Allez Pumas! If you want to follow my soccer tweets you can find me at http://www.twitter.com/rave_green - I mainly stick to joyful noises about the Sounders and the USMNT (US Mens' National Team), if I have access to Twitter while watching a match I will comment on goals or something that happens. Verry funny and nice design.